Sometimes trying to think of a great plant combination to put together in a garden planter is a bit more difficult then imagined. You drive over to the local garden center or nursery and just stand there, staring at all the choices. Over whelming, right? Well, here are the exact details on how to duplicate this vibrant and dramatic window box. We name names! 1. 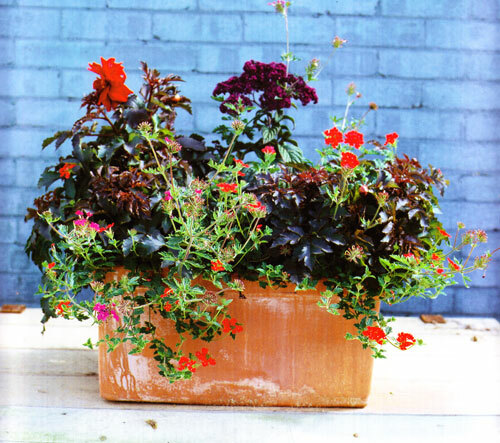 Make sure the window box planter you select is a minimum of 24� long. Fill the bottom of the window box with broken pot pieces, styrene, crushed pop cans or whatever you want to help with the drainage. Then fill the window box with compost, missing in 3 teaspoons of slow release plant food granules. Now plant the heliotrope centrally at the back of the window box, gently teasing apart the roots if necessary. This is your anchor piece. All other plant materials will arrange around this one center piece. 2. Plant the dahlias in the back corners of the planter with the black grass in the front of the heliotrope. Now we have some depth happening here that will make the planter look alive and not flat. 3. Plant the purple verbenas at the back between the heliotrope and the dahlias. Finish with the red verbenas at the front corners. This is a large container so it is best to position it before watering. These plants like full sun so make sure it�s in a good spot. Now water it thoroughly. Do this before placement so that the water doesn�t add to the weight of the clay planter when moving it. The intense purple of the heliotrope usually dominates other plants, but here it is teamed with a selection of equally dramatic colors. Mixing the purple, dark red and black grass will create a dramatic and intense look that will carry you through the season. Tip: Dahlias can be overwintered by digging up the tubers after the first frost, cutting the stems back to 6� and drying them off before storing in slightly damp peat in a frost proof shed. Start into growth again in spring and plant out after all danger of frost is past.